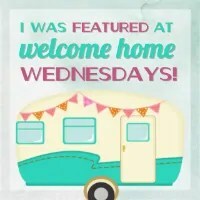 Welcome to Welcome Home Wednesdays number 27! Hi Erin, Congrats on your link party! Glad to be here and looking forward to being back next week. Quick question for you…is it acceptable to have a ‘I link to these parties’ link on my post as a linkback to your party? Yes! These gals look for backlinks when picking a feature! So it’s a great idea! Thanks for coming by, Lynn! Of course, they look so good. I have a lot of friends that need recipes that are gluten free! Erin – Congrats on your link-up Party! I’m so excited for you and I’m happy to be here! Thanks so much for hosting! You’re welcome, Ilka! I so appreciate you coming by and linking up! So exciting! Thanks for stopping by, Mistie! Yeah! Thanks! I appreciate it, Charlotte!